or magnetic pickups down to 12 mV. A-A Stopwatch Mode. Time is measured between a start pulse and a stop pulse, both on Channel A, from either the positive or negative edges. A-B Stopwatch Mode. Time is measured between a start pulse on Channel A (positive or negative edge) and a stop pulse on Channel B (positive or negative edge). This mode allows inputs from different sources. In addition, the A and B inputs can be tied together to start the stopwatch with one polarity and stop it with the other polarity. Event time (Item #1) is measured by counting 5.5 MHz clock pulses from a calibrated quartz crystal. The stopwatch output is updated during timing at a rate controlled by a gate time, up to 25/sec. Time is reset to zero when the next start pulse occurs. Accumulated time from multiple events up to 999,999 hours (Item #2) is also tracked. Time Base Accuracy Quartz crystal calibrated to ±2 ppm. The stopwatch mode is used to time single events between start and stop pulses on the same channel. Duration of a single wave shape can be measured by tying the A and B channels together. 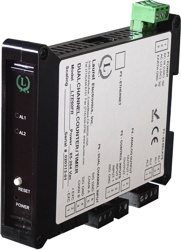 The start and stop pulses used for timing can be generated by the dual relays in a Laureate panel meter, counter, or transmitter. For instance, the start and stop pulse edges can be created as temperature passes two alarm setpoints, or as temperature cycles in a hysteresis control mode. An oscilloscope is great for viewing and timing pulses in a lab. However, in fixed installations where digital timing accuracy and control outputs are required, a low-cost Laureate time interval meter or transmitter will be the instrument of choice. Resolution to 0.2 µs is feasible. Some of the many possibilities in instrumenting a pulsed laser system with Laureate dual-channel counters and transmitters: elapsed time, number of pulses, pulse width, pulse separation, duty cycle, and pulse rep rate.